'Of Mice and Men,' first edition. Of Mice and Men is a 1937 novella by John Steinbeck. Set during the Great Depression, the book tells the story of George Milton and Lennie Small, two migrant workers and long-time friends employed on a ranch in California. Through its use of colloquial language and detailed characterization, Of Mice and Men offers an unsparing portrait of its characters and the violent and harsh conditions they face. Fun Fact: John Steinbeck's dog ate an early draft of Of Mice and Men. George and Lennie are two farm workers traveling through California in search of work. When the novella begins, they have just been kicked off a bus while journeying to their latest ranch. They spend the night in a makeshift shelter and arrive at the ranch in the morning. The ranch owner is initially hesitant because Lennie, who is physically strong but has a mental disability, doesn't speak, but he ultimately accepts the men as workers. Lennie and George meet fellow ranch hands Candy, Carlson, and Slim, as well as Curley, the son of the ranch owner. Curley, a diminutive but confrontational man, verbally targets Lennie. Carlson shoots Candy's old, dying dog. Lennie reveals that he and George have a plan to buy their own land someday, and Candy offers to join them, pitching in his own money. Slim gives Lennie a puppy from his own dog’s recent litter. The next day, Curley attacks Lennie once more. Out of fear, Lennie grabs Curley's fist and crushes it. Later, the ranch workers go out drinking, and Lennie stays behind. He talks to Crooks, an African American farm hand who lives separately from the other workers. Curley's wife approaches and asks what happened to her husband's hand. When none of the men tell her, she berates Crooks with racial slurs and threats. The following day, Lennie accidentally kills his puppy by petting it too hard. Curley's wife finds him with the puppy's body in the barn. Lennie and Curley's wife begin to converse. Curley's wife reveals her former dreams of Hollywood stardom and offers to let Lennie touch her hair. While doing so, Lennie unintentionally breaks her neck and kills her. When the farm workers discover Curley's wife's body, Curley begins a vengeful pursuit of Lennie, with the other workers in tow. George takes Carlson's gun and breaks away from the group in order to meet Lennie at their predetermined spot. George tells Lennie all about the beautiful future in which they have a farm of their own to tend to rabbits, then finally shoots Lennie in the back of the head. Lennie Small. Contrary to his surname, Lennie is an extremely large and physically strong man. However, he is also gentle-hearted and often fearful. Lennie has a mental disability and is dependent on George for protection. He loves rubbing soft materials and small creatures, from mice to puppies to hair. This desire leads to unintentional destruction and even death. George Milton. Crafty and resourceful, George is both the domineering leader and loyal protector of Lennie. Although he sometimes complains about taking care of Lennie, he is deeply committed to him. At the end of the novella, George decides to kill Lennie in order to protect him from greater harm at the hands of the other ranch workers. Curley. Curley is the son of the ranch owner and a former Golden Gloves boxer. Despite his small stature, Curley picks fights and struts around confidently. He is a jealous husband who rages at his wife. He also targets Lennie, despite the fact that gentle Lennie doesn't want a fight. When Lennie accidentally kills Curley's wife, Curley seeks out Lennie in a murderous rage. Candy. Candy is an old farm worker who has lost a hand. He owns an aging dog that Carlson insists upon shooting. When Candy overhears Lennie talk about his plan to buy some land with George, Candy offers up $350 of his own money to join them. Crooks. Crooks, the only African American character on the farm, lives away from the other workers in segregated quarters. He is world-weary and skeptical of Lennie's dream of buying land. Crooks faces racism on the ranch, most notably when Curley's wife verbally attacks him with racial slurs and violent threats. Curley’s wife. Curley's wife, whose name is never mentioned, is treated badly by her husband and warily by the other farm workers. She has a flirtatious nature, but she also expresses loneliness and lost dreams during a conversation with Lennie. When Crooks and Lennie refuse to tell her what happened to her husband's hand, she verbally attacks Crooks with racial slurs and threats. She ultimately dies an accidental death at Lennie's hands. The Nature of Dreams. Dreams play a key role in Of Mice and Men. Most significantly, George and Lennie share a dream of owning their own land, but their perspectives on this dream differ significantly. In Lennie's mind, the dream is sure to become reality; for George, discussing the dream is a way to comfort Lennie and pass the time in a harsh environment. Strength vs. Weakness. In Of Mice and Men, strength and weakness have a complex relationship. This relationship is most evident in Lennie, whose physical strength is a direct contrast to his gentle and guileless personality. In the tough world of the book, strength—particularly mental toughness—is essential. Man vs. Nature. Tension between the human world and the natural world exists throughout Of Mice and Men. Sometimes the characters exert control over the natural world, and sometimes, the natural world rises up to overpower the characters. Ultimately, the novella suggests that the natural and human worlds—the worlds of mice and men—are not so different after all. Of Mice and Men's literary style is largely simple and straightforward. The dialogue is written in a colloquial dialect intended to reflect the working-class backgrounds of the ranch workers, whose speech is also peppered with slang terms and vulgar expressions. The novella is also notable for its use of foreshadowing. Lennie's accidental murder of the puppy parallels his accidental murder of Curley's wife; the apparent mercy killing of Candy's dog mirrors the mercy killing of Lennie. 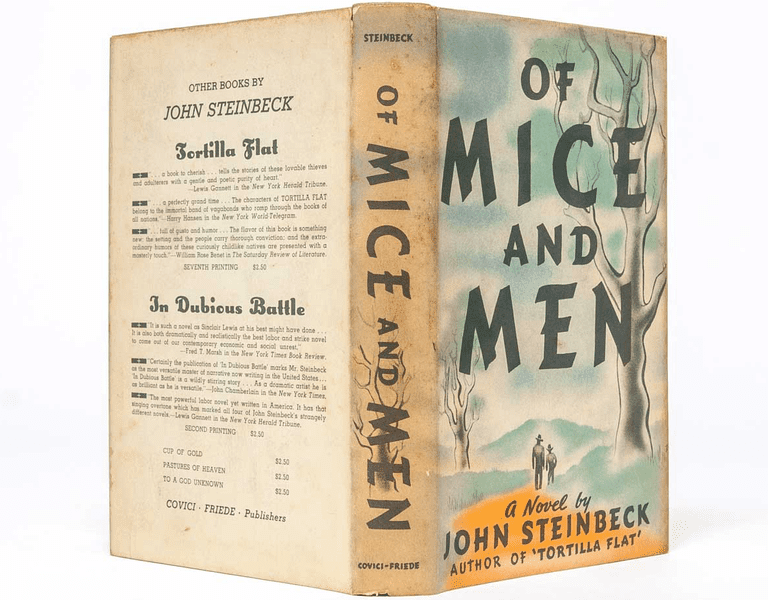 Of Mice and Men has been the subject of censorship due to its harsh subject matter, but it remains one of the most widely-read works of American literature of the 20th century. Born in 1902, John Steinbeck is one of the most prominent and widely-read American writers of the 20th Century. Much of his work focuses on "everyman" protagonists in California during the Great Depression. He said that Of Mice and Men was inspired in part by his own experiences alongside migrant workers during the 1910s. In addition to Of Mice and Men, Steinbeck penned over two dozen books, including The Grapes of Wrath (1939) and East of Eden (1952). He won both a Pulitzer Prize and a Nobel Prize.